July 8, 2013 - On Sunday at 11: 20 AM a 1958, de Havilland DHC-3 Otter, N93PC, operated by Rediske Air crashed killing all 10 onboard. 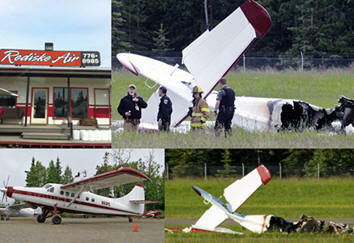 The air taxi crashed at Soldotna Airport in Soldotna, Alaska, 75 miles southwest of Anchorage. The aircraft became engulfed in flames before firefighters could get to it. The National Transportation Safety Board investigator Clint Johnson said "We do have 10 fatalities, unfortunately, nine passengers, and one pilot". The instrument rated pilot has been identified as 42 year old Walter William Rediske who is also the owner of the company. Late Sunday all 10 bodies were recovered and taken to the State Medical Examiner's Office in Anchorage for autopsies and positive identifications. It was reported the crashed occurred as de Havilland Otter was taking off. At the time of the accident there was light winds and cloudy. Captain Lesley a firefighter out of Central Emergency Services said "We saw the plume immediately when we left the station. It was a big, black cloud of smoke visible from the station, about three driving miles from the airport. It took firefighters over ten minutes to put out the fire. The airport has one 5,000 foot asphalt surface runway designated 7/25. The de Havilland Otter crashed of the side of the runway. According to the Soldotna Police Department the passengers are believed to be from South Carolina. Rediske Air Inc. has been in operation since 1991. The company specializes in air transportation, sightseeing tours, aircraft charters, plane charter and freight services. The company services Anchorage and Kenai, Alaska and the surrounding areas. The company is located at Island Lake Rd Porter Dr., Nikiski, Alaska.